As we look forward to 2018, we took a moment to look back on 2017. Here are some of the highlights of 2017. Clarified our mission and established a vision of our future. Introduced Director roles in the areas of Project Management, Design Communication, Production, Interior Design, Design Implementation and Design Technology and promoted Jonathan M. Taylor and Neal Bijlani to Associate. 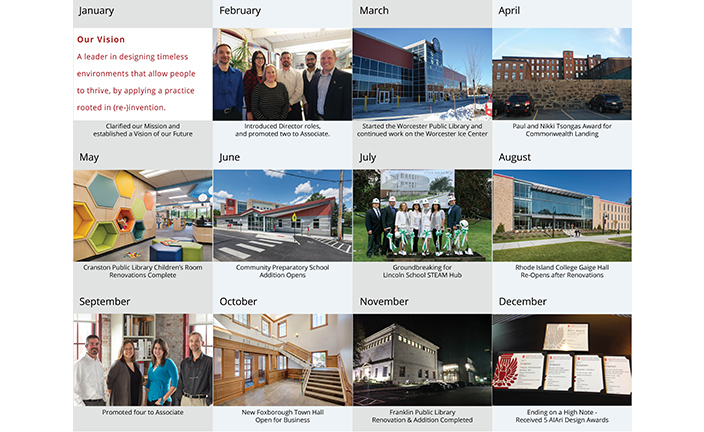 Expanded our presence in Worcester through our work at the Worcester Public Library and Worcester Ice Center. Commonwealth Landing in Fall River is awarded the Paul and Nikki Tsongas Award. Cranston Public Library Children's Room renovation is completed. Community Preparatory School addition opens. Click here to learn more about project. The groundbreaking for Lincoln School STEAM Hub took place this month. Rhode Island College Gaige Hall re-opens after renovations in time for the start of the Fall semester. Promoted Brian Valentine, Cara Pomeranz, Meaghan Kennedy, and Enno Fritsch to Associate. New Town of Foxborough Town Hall officially opens for business. Renovations and addition to the historic Franklin Public Library are completed. More information and photos to follow. Ending on a high note with five AIAri Design Awards - a Merit Award for the Cranston Public Library Children's Room, and Citation Awards for Thayer Homestead, Byrant University Physician Assistant Learning Center, Boyden Library and Harvard Business School Knowledge and Library Services.